Citation Information: JCI Insight. 2016;1(8):e86292. https://doi.org/10.1172/jci.insight.86292. 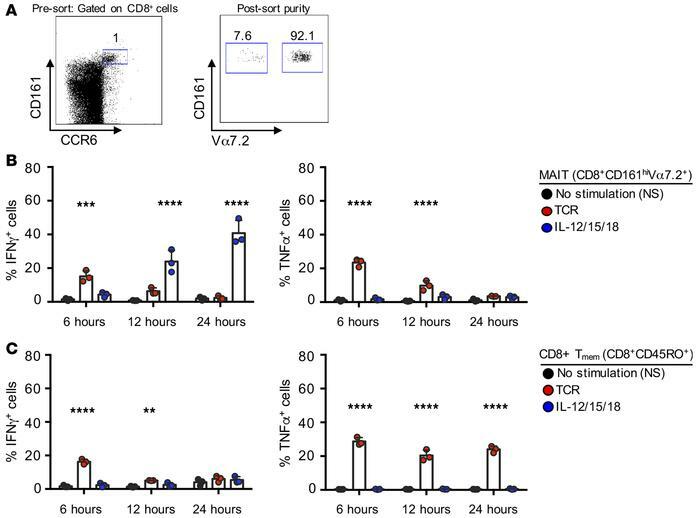 A TCR signal alone is not sufficient for sustained effector function in MAIT cells. (A) A representative flow plot of the CD161hiCCR6hi MAIT cell population in peripheral blood mononuclear cells (PBMC) after gating on CD8+ T cells is shown (left panel). MAIT cell purity was confirmed after sorting CD8+CD161hiCCR6hi cells by determining Vα7.2 expression in a small aliquot (right panel). (B) Five thousand sorted CD8+CD161hiVα7.2+ MAIT cells were rested (no stimulation, black circles); stimulated with anti-CD3/CD28 beads (TCR, red circles) or 100 ng/ml of IL-12/15/18 (blue circles) for 6, 12, or 24 hours; and analyzed for expression of IFN-γ and TNF-α (n = 3). (C) Five thousand sorted CD8+CD45RO+Vα7.2– memory T cells (CD8+ Tmem) were rested (no stimulation, black circles); stimulated with anti-CD3/CD28 beads (TCR, red circles) or 100 ng/ml of IL-12/15/18 (blue circles) for 6, 12, or 24 hours; and analyzed for expression of IFN-γ and TNF-α (n = 3). Data displayed are the average of 2–3 technical replicates for each donor, with each data point representing a single donor (n = 3, B and C); data are displayed as mean ± SEM (where applicable). **P ≤ 0.01, ***P ≤ 0.001, and ****P ≤ 0.0001. P values were determined by comparing treatment conditions to no-stimulation conditions for each time point. Two-way ANOVA, with Dunnett’s test for multiple comparisons (B and C).